Having been involved in the insurance industry for more than two decades, it is safe to say that 2011 was by far the most challenging year that our team faced in terms of insuring the needs of our clients and the overall insurance picture for the forest industry. 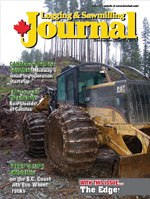 Educating our client partners on the short term and long term challenges being faced in this sector of the industry has been a focus for our National Forest Practice Division—and it will form the basis of a number of articles for Logging and Sawmill Journal, of which this is the first. To understand where we are today, we need to be aware of three key events that occurred in the past 15 months that were the catalyst for the increased rating that the forest industry is now experiencing. In September 2010, Lumberman’s Underwriting Alliance (LUA) announced that they would be reducing their capacity (total dollars available to insure for any one client), and would no longer insure 100 per cent of the total insured values required on larger sawmill operations. LUA cited a high three year loss ratio (in excess of 140 per cent) and increased reinsurance costs as the reason for this significant change. By reducing capacity, LUA preserved their reinsurance costs and could provide a stable platform for future renewals. As an example, a sawmill operation with a total insured value of $100 million that had been insured 100 per cent by LUA, would now be insured by LUA for 40 per cent. Additional underwriters would be required to “subscribe” to the risk and make up the remaining 60 per cent. Insuring the needs of operations involved in sawmilling or the manufacture of wood products presents one immediate challenge for insurance brokers: there are only a small number of insurance companies (or markets) that have any interest in this class of business. Over the years, large, high profile losses have been seen by the entire underwriting community. This, of course, has diminished their interest in working in this class of business, limiting the number of markets to a single digit percentage of the overall insurance industry. During the first quarter of 2011, there were a number of sawmill fires in Western Canada that not only impacted LUA, but another company in the market, ACE INA. ACE INA was a strategic partner and key underwriter that had been willing to work with our team in providing subscription capacity on the LUA program. Our excitement about this partnership, however, was short-lived. In April, 2011, we were advised by ACE INA that they were withdrawing from this class of business in its entirety, citing losses as the primary reason. The effects of this news had an immediate impact on rating. The remaining markets understood that ACE INA had pulled out of this sector due to losses, which in the simplest terms equated to poor rating. One less company in the market = higher rates. In November 2011, the most shocking news of the year took place. LUA announced that they would be winding down their Canadian business operations entirely. Policy renewals would be provided until December 31, 2011 and all polices expiring in 2012 would be lapsed. December 31, 2012 will mark the last day that LUA will transact insurance business in Canada. Poor loss ratio and downgrading by the industry watchdog AM Best were key factors in LUA making this difficult business decision. It should be noted that the LUA operations in the U.S. will continue operating and be unaffected. With two major underwriters withdrawing from the industry, citing poor loss ratio as the reason, the effects have been immediate. Supply and demand dictate that with lower supply and stable demand, higher prices are inevitable. Combine this with the industry loss ratio average of 150 per cent and it is obvious that the remaining interested underwriters will participate at rates that are not remotely close to what we have seen in the past five to ten years. The moment that our HUB International team in British Columbia heard the announcement that LUA were winding down their Canadian business operations, we took action. Jacques Gagnon, the former vice-president of LUA Canada, with over 25 years’ experience, was hired to head our National Forest Practice Division. Our President of Canadian business operations, Jim Barton, immediately began meeting with our underwriting partners and forging proprietary exclusive relationships, allowing our team to work more effectively in providing long term, stable insurance solutions to our clients and prospects. We have enhanced our Loss Prevention and Risk Control Department by hiring three employees from LUA, and expanding our Risk Control Practice to provide more services and solutions to our clients in minimizing and managing risk. Our team at HUB International is working on a number of solutions and has a plan in place that is assisting our clients in fully understanding the markets and their renewal process. As the largest insurance brokerage in Canada, and a company that works with the most respected sawmill operations in the country, we welcome the opportunity to discuss the HUB Advantage with your company.